Here is William Pandie in the fur. William Pandie was caught in a drug deal gone bad and was arrested (making him a Hard Cycle) and instantly caught the bad eyesight of Miley who thought he was Adolph Pandie back from the war (the war which Rederick killed him in). William at first got irritated about being called Adolph, but eventually he got used to the nickname when her right eye went blind. He might be a reincarnation of the original Adolph Pandie (Snipe is another one, no one said that there cannot be multiple reincarnations.) and is the potential love interest for Mindy. 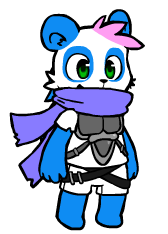 He's also Snipe's older brother and Panda's cousin. He dyed his hair Pink because it's the color representing Penitatas Abuse Awareness and pretty much is side by side with Breast Cancer Awareness because millions Penitatas was beaten, raped, abused, and even killed every day despite Damien's "Penitatas are not objects" protests. Damien was killed by his parents to shut him up and eventually they were tried and convicted for the murder. Afterwards, Damien's Law was signed, a bill that is the reason for the laxed punishments (It still happens, though). Thanks, I was scared a little bit of introducing this character due to the nickname Adolph, he's suppose to be in Episode 5. He has an Off-Duty Outfit and is one of the rare pants-less males.